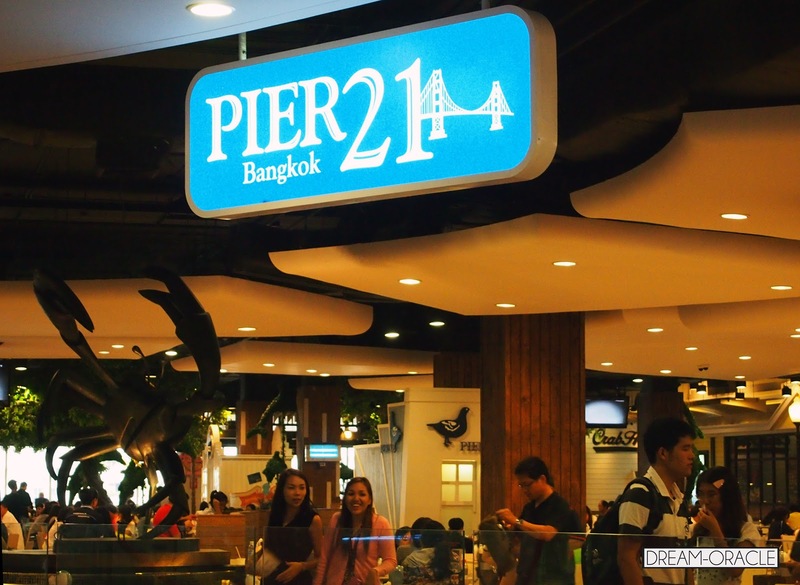 Pier 21 is this foodcourt located on the upper levels of this shopping mall called Terminal 21. 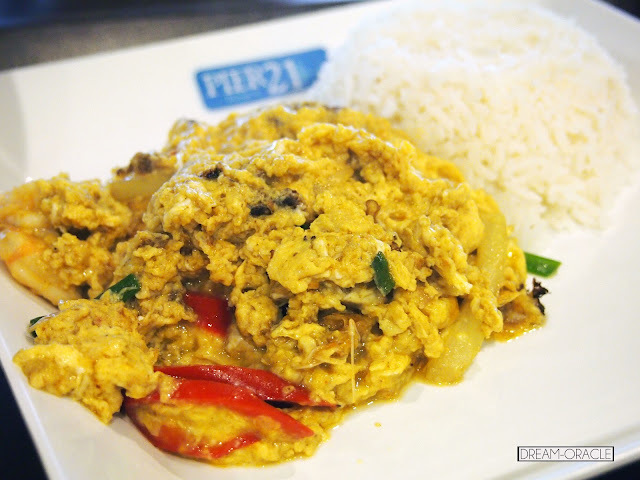 It's a relatively new place, but the food court boasts an exciting variety of authentic Thai cuisine. It's a good place to go if you're a beginner in Thai food, because you can watch, compare and decide which dish interest you. An alternative is to go with a large group, so you can each order something different and share among yourselves. This is a good way to sample a variety of Thai food at an affordable price. 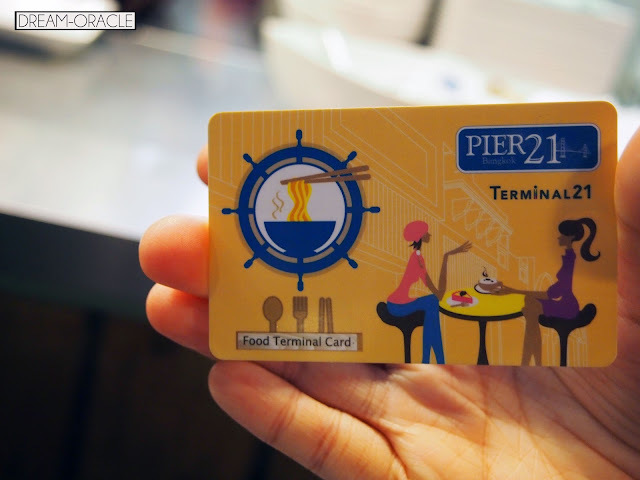 In Thailand, most of the foodcourts use a card or coupon system to ensure hygiene is maintained. So make sure you take a turn around the foodcourt to see what you would like to eat, take note of the price then go to the counter to top up your card. You don't have to buy the card. After your meal, you can simply take it back to the counter for refund (if you have balance leftover), and they will take the card back. I like this. The egg was slightly runny and the basil leaves left an amazing fragrance. The downside is the prawns inside the egg were tiny, and they still had their shells on. Makes it kinda tricky to eat because you still have to dirty you hands to de-shell the prawns. Maybe I should start calling them shrimps. They were really smallllll. Not satisfying at all. So yes, the flavour of the dish was great but it could have been better if the prawns were bigger and de-shelled. This bowl of soup is so..empty. Two or three eeny weeny tiny prawns and.. no more. Seriously lacking in substantial ingredients. But the soup is not bad. Not the best I've tasted but still pretty decent. It has kick and it managed to hit all the right spots. I don't have issues with it, except for the serious lack of ingredients. 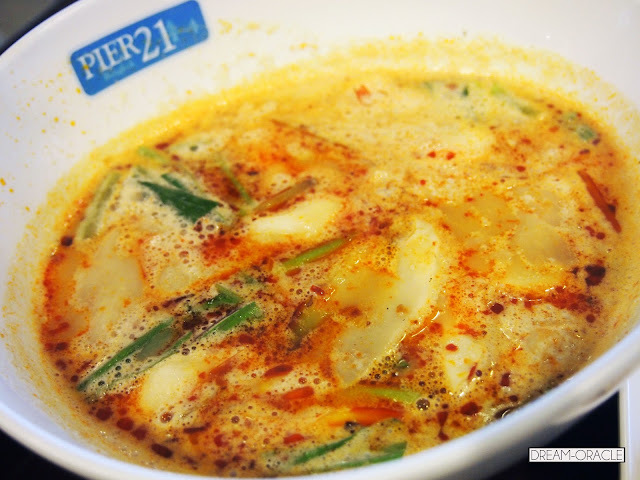 But I must mention that the wide variety offered at Pier 21 is really amazing. I saw Green Curry Fried Rice and many other enticing dishes. So if you happen to be hanging around Terminal 21, I would recommend you to pop by the foodcourt for some bites. It doesn't hurt that the foodcourt looks very San Franciso-ish, and squeaky clean.